Motorhome has a home! 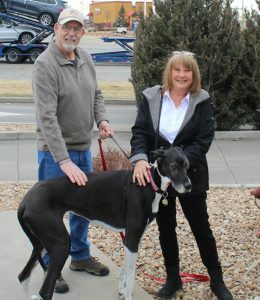 - Rocky Mountain Great Dane Rescue, Inc.
Motorhome has a home with her new family in Fort Collins, CO! The timing was right for Michele and Bob to adopt a Dane, and they knew they wanted to rescue an older dog. Motorhome, may be 8 years old, but she does not act her age! She loves to run and play, and will have a giant new yard to do so in. She will love hanging out with Michele and Bob’s grandson Evan, and will also share her home with Princess Laia, a three year old Calico cat. Motorhome will have company during the day, and will be getting all the ear and belly rubs she can stand! We are so happy for this senior girl, and her new family! Way to go sweet Motorhome!